A hardy evergreen herb with excellent culinary and medicinal uses. In the herb garden, alongside a sunny garden wall, or in containers, the plant releases a wonderful aroma when brushed against. Winter savory has been used for hundreds of years. Both it and summer savory have been grown and used side by side. Both have a strong spicy flavour and a good reputation in the kitchen. In addition to this, medicinal properties of this plant are numerous, making it a worthy choice for any garden. It also makes great ground cover for dry and sunny places and is perfect for containers, either alone or in combination with plants that won’t shade it out. The flowers open in the summer, adorning the plant with tiny pink/white blossoms that are very attractive to insects. It makes a great companion plant, working especially well with onions and beans to help repel pests. To order this plant please contact us balkanecologyproject@gmail.com. Suitable for: light (sandy) and medium (loamy) soils and prefers well-drained soil. Suitable pH: acid, neutral and basic (alkaline) soils and can grow in very alkaline soils. Cannot grow in the shade. Prefers well-drained soil and can tolerate drought. habit: spreading to form a mat,has a low bunching habit. Leaf:A very useful herb, the strongly aromatic leaves are used as a flavouring in cooked foods and it makes a good tea. 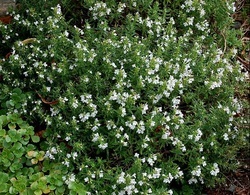 Medicinal: Winter savory has marked medicinal benefits, especially upon the whole digestive system. A sprig of the plant rubbed onto bee or wasp stings, brings instant relief. A good dense ground cover plant for sunny positions. In temperate climates it can go dormant in winter. All the stems which appear dead will leaf out again in the spring. It can be used as a companion plant for beans, deterring bean weevils. Easy to grow, it can make an attractive border plant for any culinary herb garden.